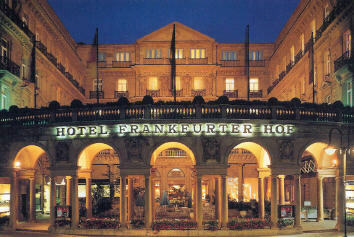 For this is where we are: on the Kaiserplatz in the centre of Frankfurt, at the Steigenberger Frankfurter Hof. Since it opened its doors in 1876, this mighty Classical edifice of brown stone has welcomed everyone from Albert Schweitzer to Elton John. Gutted by fire in the Second World War, its 300 bedrooms have been restored in a spare, elegant style. My own apartment, number 230 on the second floor, was remarkable for the abundance of its space. Off its hall was a wardrobe and dressing room; and through its French doors was a balcony, from which I could glimpse church towers and admire some of the city’s impressive new tower blocks. This was designated a deluxe room and was priced at 523 euros, bed and breakfast for two. (There are weekend offers which reduce this price substantially.) I liked its orange/brown colours and light wood, and I appreciated the pristine white, black and grey of the bathroom, with its separate loo and bidet. Also to my taste was the absolute quiet – broken only when I found the note on my bedside table, telling me how to tune the television set to the Classical music radio station. Thereafter I sat at the desk or sprawled in one of the easy chairs and dozed to Beethoven and Bach. All very civilized. As it was downstairs, too. For the hotel’s public spaces are furnished with flair. In the afternoon I quaffed a pot of English Breakfast tea in the yellow lounge, sitting on a fauteuil upholstered in blue silk. The young waiter – smart in his gold, striped waistcoat – brought to me a slice of chocolate cake. I noted his friendliness and efficiency, and saw these qualities again in the waitresses who looked after me so well at breakfast in the Hofgarten. This light, airy chamber houses a buffet laden with good things. I am not a great fan of the morning buffet arrangement (excessive walking before mid-day is not generally to my taste), but I have to admit that my plates of melon and pineapple, bacon and mushrooms and crusty bread with raspberry jam were notable for the high quality of their ingredients. I started my days at the Frankfurter Hof well. And so to the evening, dinner and the hidden gem. Actually, the Restaurant Français does not hide. It does its best to be noticed. But the Michelin inspectors refuse to acknowledge its superb quality. Which is odd, because – on the evidence of my meal – this is a dining room which thoroughly deserves one of their coveted stars. In truth, it has its own star already – its young chef, Patrick Bittner. With his height and his long blond hair, Herr Bittner might be a film star or a footballer. Instead, he is a cook of prodigious talent. Such food deserves a handsome setting. And it has one. The two small rooms of the Restaurant Francais are full of visual delights: silver candelabra, crystal chandeliers, oil paintings, white damask and polished mahogany. Domes are lifted and napkins are exchanged by waiters in black tie. I would prefer there to be no canned music, but at least it is good canned music. (I noted the inclusion of Benjamin Britten.) And the service I received from Stefan Sieben was faultless. From a list which runs from a Provençal rosé at 21 euros to 1997 Grange at 453 euros, Stefan brought to me a trio of wonderful bottles, two German and one Australian. 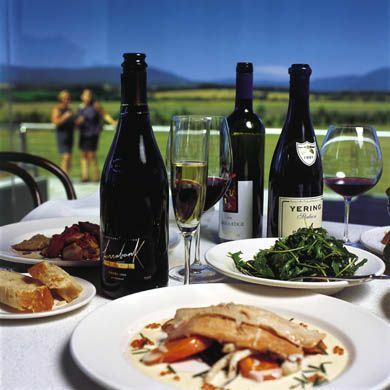 The 1999 weisser burgunder & chardonnay was in the new German style – firmly structured, with evident toast and butter (Karl Johner, 51 euros). The 1998 Cape Mentelle cabernet was everything I expect from this brilliant producer – oozing black fruit and tobacco (86 euros). And the half-bottle of 1999 riesling beerenauslese from the famous estate of Schloss Johannisberg, produced by Count von Metternich, was one of those miraculous low alcohol (9%) German wines – achieving a stunning balance of sweetness and acidity (98 euros). All these were poured into good Schott glasses. The manager of the Steigenberger Frankfurter Hof, Peter Leitgeb, deserves credit for the all-round excellence of his hotel. 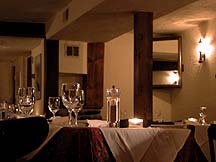 He can be proud of his staff and, most of all, he can be proud of his hidden gem, the Restaurant Français. I doubt it can remain hidden for much longer. Bethmannstrasse 33, Frankfurt am Main 60311, Germany. Double rooms from 425 euros, breakfast extra. Ask about special offers.